Karma Boutique is a consignment shop stocked with designer women’s apparel at affordable prices. Check out the tops, sweaters, coats, shoes and boots and the large selection of jeans from a variety of designers. 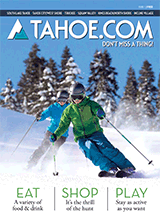 You’ll find some vintage clothing pieces as well as local apparel by Tahoefab. Accessories include jewelry, sunglasses and a diversity of handbags. Stop in to peruse the racks, and bring in your unused high-end clothing and accessories to sell or trade. Karma Upscale Resale Boutique is adjacent to Starbucks in Incline Village and is open daily.